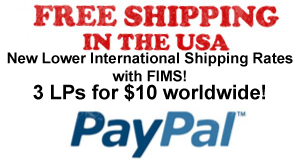 LOWER International Shipping through FIMS: Fed Ex International Mail Service! 3 LPs for $20 postage! When the US postal service increased their rates a couple of months ago we were shocked. So we went into action to see if there was anything we could do to offer better rates of for international customers – and we found away with FIMS – Fed Ex International Mail Service. What they do is fly the packages over on Fed Ex planes and then put the parcels in the destination country’s postal system. We’ve learned that all packages going into Europe are being sorted and mailed from Sweden, similar central points exist in South America and Asia. It takes a little extra time (averaging an extra week in most countries but 2+ extra weeks in Australia)… but it is MUCH cheaper! You can now ship 3 LPs anywhere for $20! CDs and 7″ are lighter so you get more of those for the same $20! Like regular first class airmail through USPS, there is no tracking available – if you must have tracking the only option is to pay the insanse priority mail rates through the USPS. We kinda assume you don’t want to do that.